About: Upcoming opportunity for GW researchers with current or recent funding from the Department of Defense to present their work. 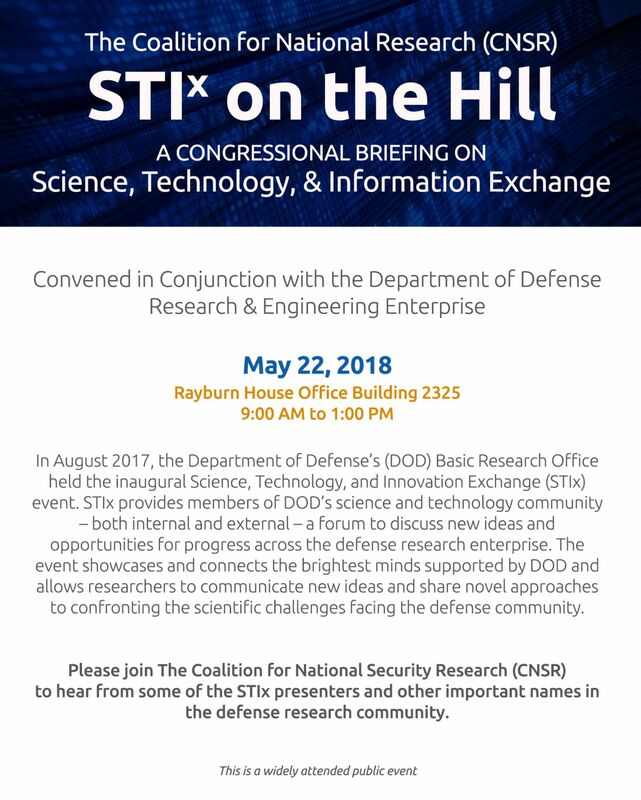 This is a great showcase of innovative DOD-funded research for Members of Congress and their staff. Questions: Please contact Shane Seger in OVPR if you are interested in presenting a poster at the briefing’s poster session, and to be connected with the event's organizer. Award: $5,000,000 - $10,000,000 in total budget, with durations of up to five years. About: The Secure and Trustworthy Cyberspace (SaTC) program welcomes proposals that address cybersecurity and privacy, and draw on expertise in one or more of these areas: computing, communication and information sciences; engineering; economics; education; mathematics; statistics; and social and behavioral sciences. Proposals that advance the field of cybersecurity and privacy within a single discipline or interdisciplinary efforts that span multiple disciplines are both encouraged. The National Science Foundation (NSF) Division of Mathematical Sciences (DMS), in collaboration with the Division of Molecular and Cellular Biosciences (MCB), seeks to promote interdisciplinary research that enables novel mathematical and computational approaches that capture and explore the full range of mechanisms and biological variability needed to better understand biological systems behavior across multiple scales. Proposals in response to this DCL should be submitted to either DMS via the Mathematical Biology Program Description or the MCB solicitation, NSF 18-585, directed to the Systems and Synthetic Biology program (8011). The proposal title should be prefaced with "MODULUS:". The MCB solicitation accepts proposals to core programs or to a Rules of Life (RoL) track. Submission to either track is permissible given that the guidance as detailed in the solicitation (NSF 18-585) for each is followed. For proposals submitted to MCB and targeted for the RoL track, a second program in another BIO Division must also be identified. Neither Division puts limits on proposal budgets and expects budgets to be appropriate for the scope of the project proposed. PI's are invited to provide feedback on the Pre-Award and Post-Award processes. This is part of our continuing efforts in enhancing the grant support experience of CCAS faculty. The DC CTSA Consortium Presents: "Spring Regulatory Update and Hot Topics in Clinical Research"
Award: $300,000 in support - $75,000 per year for four years. If you wish to pursue, let us know at ccasres@gwu.edu. The CCAS Dean's Office is pleased to continue our CCAS Dean’s Research Excellence Award for Mentoring (DREAM) program. This award is to recognize the contributions of our faculty who provide research mentoring for their colleague(s). CCAS full time faculty (including tenured, tenure track, contract, or research faculty) are eligible for the competition. An honorarium of $1,000 will be awarded to the top recipient of award. Call for nominations for the 2018-2019 CCAS Dean’s Research Excellence Award for Mentoring (DREAM). DUE: Monday, April 22, 2019. Cover letter from the nominator, who should be a regular faculty (tenured, tenure track, or contract faculty member) in CCAS. Letter of support from a faculty mentee. Statement of nominee's mentoring activities and its impact in recent years. Biosketch for the nominee, up to three pages. The applications will be reviewed by the CCAS Research Advisory Committee, which consists of three faculty members from each division: Arts and Humanities, Social and Behavioral Sciences, and Natural and Mathematical Sciences. If a current CCAS Research Advisory Committee member is a nominee, a faculty member from that division will be selected as a replacement by the Associate Dean for Research in consultation with the Dean. The committee will review all application packages and make recommendations to the Dean who will make the final decision. The Dean will notify nominees of his decision in May 2019. An award ceremony will be held during the CCAS Faculty Celebration event towards the end of semester. The WOWTALK (What’s Our Work) Series brings together colleagues and students from disciplines associated with GW's Science and Engineering Hall—and related fields—to present new research and share ideas. These short talks (15-20 minutes each) are designed to introduce members of the GW community to current and exciting research projects undertaken in labs in the SEH, to initiate discussion, collaborate, share expertise, and to promote research performed in the SEH and at GW. Speaker: Dr. Şenay Ağca, Program Director, Division of Social and Economic Sciences, National Science Foundation / Associate Professor of Finance, GWSB, will present an overview of NSF, its recent solicitations and competitions, including those in the Social and Economic Sciences. A new event series focusing on the techniques and strategies for successful grant and fellowship applications, with panel discussions by experienced colleagues, presentations from funding agencies, as well as other types of events that could boost the competitiveness of grant and fellowship applications from CCAS faculty.